Another sweet little Sugar Nellie digi image today – called Melissa. Isn’t she just adorable? I love these digis as they’re pre-shaded and that makes coloring so easy! My card base is a standard A2. I’ve layered three different pieces of designer papers, two of which have punched borders over top of the card base. Next a piece of thin ribbon was taped vertically, followed by a piece of white ribbon placed horizontally. Two tiny simple bows were added next and topped with a white button. I used a bit of red twine to tie the button around the two bows. The image was colored in Copics and cut out with a nesties die. 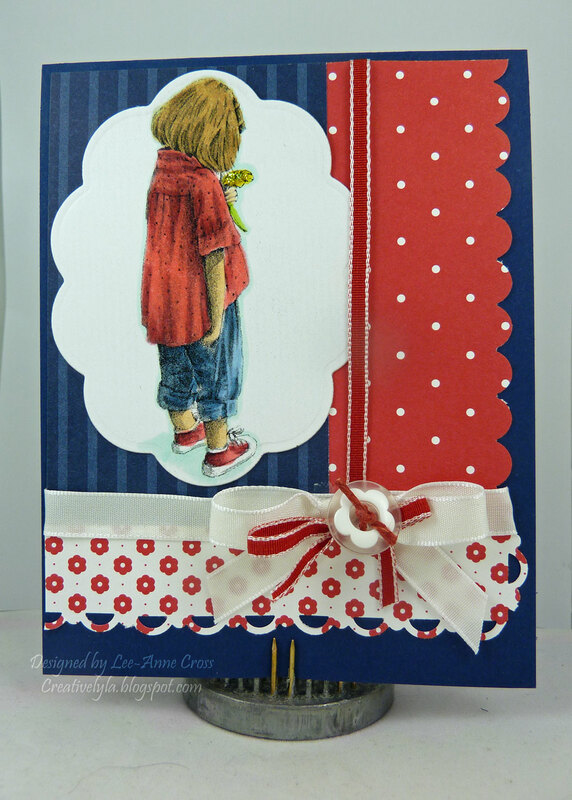 Accessories: Big Shot Pro, Large Scalloped Oval (small), Stampin’ Up Scallop Edge Border punch, Scallop Trim Border punch, Real Red 1/8″ Taffeta ribbon, Whisper White 3/8″ Taffeta ribbon, retired white button, retired twine, glue dots, Copics: E00, E21 for her skin; Y13, YG25 for the flower; B93, B95, B97 for her blue jeans; R43, R46 for her shirt; E50, E53, E55 and E57 for her hair.